I have such mixed feelings about his “Blood Birthday”. If he was here and everything had gone according to our plans, it would have been cause for a big celebration. However, things did not go according to plan. The new blood destroyed his body; it’s disturbing. He was so brave about the whole thing. He never asked why he had to go through what he went through. He trusted us. He so sweetly told my mom the day of transplant that he was, “…a little nervous.” The only thing I’m celebrating a year later is what we celebrate every day–Reece. But whatever our party here theoretically would have looked like, it would have paled in comparison to what he is experiencing now. That doesn’t change the hurting part here, but I take comfort in knowing that. Many memories from the hospital have all merged together, but I will never forget a year from today when Reece awoke at 4 am, the day after transplant, ready to play the entire day. Being six months pregnant, I tried to fight through the tiredness to enjoy it. In fact, it is my last memory of him wanting to get down and play with toys on the floor. I’m sure he did so for a few days after, but I cannot distinctly remember what day the floor playing ended. 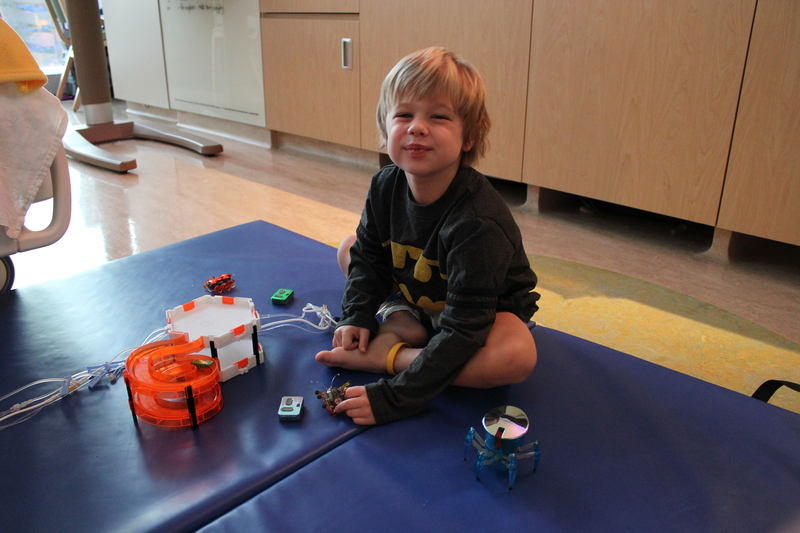 Playing with Hexbugs the day after transplant!